In my last blog post I looked at a libel case between two Exeter medical practitioners. It was interesting to see how professional reputations were at stake and the ways in which practitioners called each other’s skills into question. For this post I’m staying on a similar theme, but this time a medical practitioner plays the part of a key witness in a bitter dispute between two ‘Gentlemen’ from the Welsh marches in the 1630s. 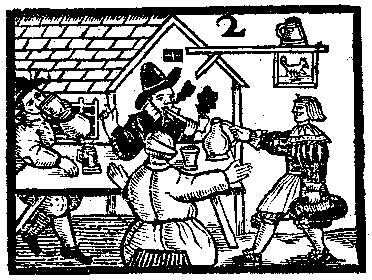 In September 1634, members of the families of Heane and Callow were enjoying an evening’s revelry in an alehouse in Brockweir, Gloucestershire. No doubt oiled by good sack, a discussion about the wardship of a young member of the Heane family quickly became a debate….and inevitably a dispute which quickly got out of hand. 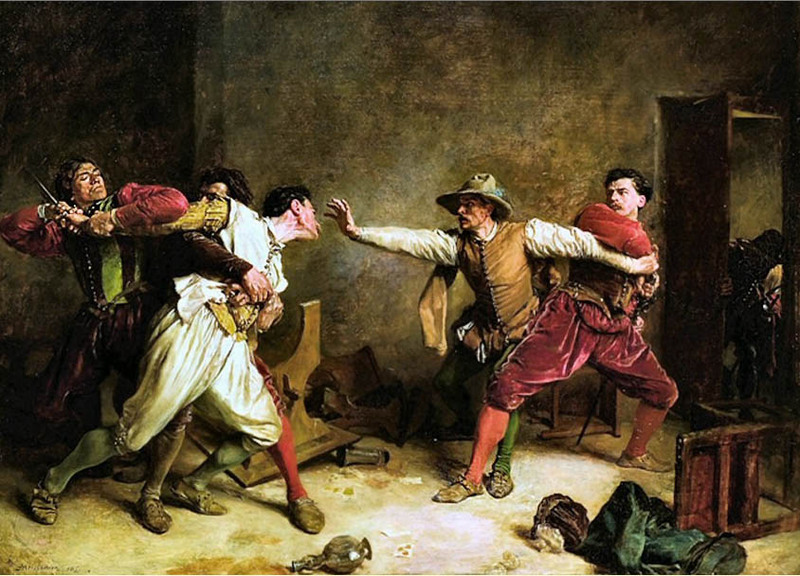 At some point a £10 wager was made and a member of the Heane family declaimed, loudly, that ‘the Heanes were as good men or better’ than the Callows and challenged them to back up their boasts with weapons. That did it. Rowland Callow called Walter Heane a ‘base rogue and a Villaine’ (strong stuff in the 17th century) and promised to ‘have Heane’s hart’s blood’. Callow made a grab for Heane’s sword, pulling it partly out of its scabbard, but things didn’t quite go his way. In pulling out the sword he severed one of his own fingers! As was often the case, this one single flashpoint was the catalyst for a bitter feud that spilled over into other arenas and quickly came to court. Aside from the question of injury, both to Callow’s fingers and also to the reputation of both men, a variety of other petty accusations began to fly. Callow accused Heane of failing to present one of his nephews for the crime of trespass on Lord Pembroke’s estates. Heane called Callow’s witnesses ‘infamous and of no credit’, and others of taking bribes, living incontinently with a woman in Ireland and keeping an unlicensed alehouse. The stage was set for a court battle of epic proportions. 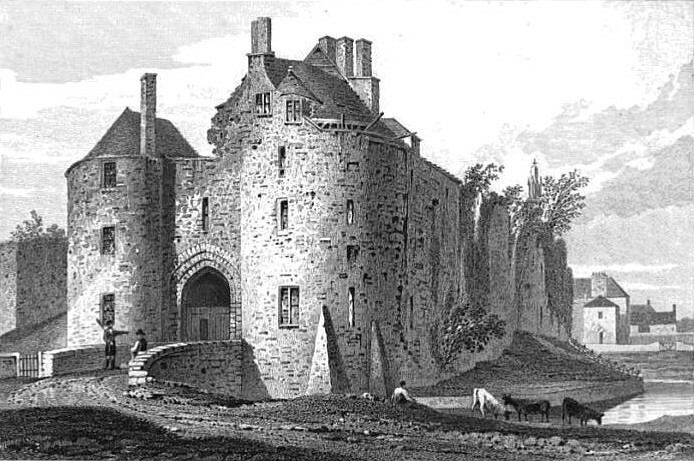 In January 1635 depositions began to be heard in Monmouth and a commission was further held in St Briavels in May 1635. It is interesting to examine some of the evidence that was heard before the commission. The defence was based on whether certain actions and words had taken place. Had, for example, Callow called Heane a rogue and a villain. Had he indeed threatened to have Heane’s blood and had he, as some witnesses had it, struck Heane, drawing blood and then, in a Tyson-esque show of fury, bitten off a piece of Heane’s ear? John Morgan, a Malster also of Dean Magna, suggested a different course of events. As Callow had no weapon of his own, Morgan ‘Saith that Walter Heane did then draw his sword out of the scabbard and did strike Rowland Callow and cutt his little finger so much that it hanged downe’, and Morgan ‘was fayne to splint it up; and had done him further hurt if the company had not stopped and prevented him, by which Rowland Callow has lost the use of his finger’. Here the finger was purposefully severed by Heane, rather than a result of Callow’s misjudged grab! Other witnesses testified to the finger ‘hanging down’ after the scuffle but other embellishments began to enter, such as Heane taking up a ‘great stone with an intention to throw it at Callow’s face’ and then ‘did buffet [Callow] on the face with his fist so that his face therewith brused and grew black and blew’. The case dragged on, with testimony after testimony beginning to test the patience of the commissioners. Debate moved from the original incident to claim and counter claim, questions of ‘gentlemanliness’ and reputation, accusations of impropriety, and on it went. Finally the commissioners had enough. Sentence was due to be passed in May 1636 but was first referred to arbitration…which dragged on until January 1637. Frustratingly the final judgement is not recorded but something of the exasperation of the authorities can be gleaned from the comments of Sir Richard Catchmay, bailiff and local process server. Perhaps without much sarcasm he suggested that the two men should simply settle matters by seeing ‘which of them could leap furthest into the River of Wye’! I’ve just returned from a great conference at the University of Exeter – the Landscape of Occupations – organised by the project on early-modern medical practice of which I’m a part. There were a great variety of papers and many different aspects of occupation, occupational titles and identities and a range of other factors relating to ‘work’ in early-modern Europe. One of the papers I was struck by was given by Professor Laurinda Abreu of the Unviersity of Evora, Portugal. 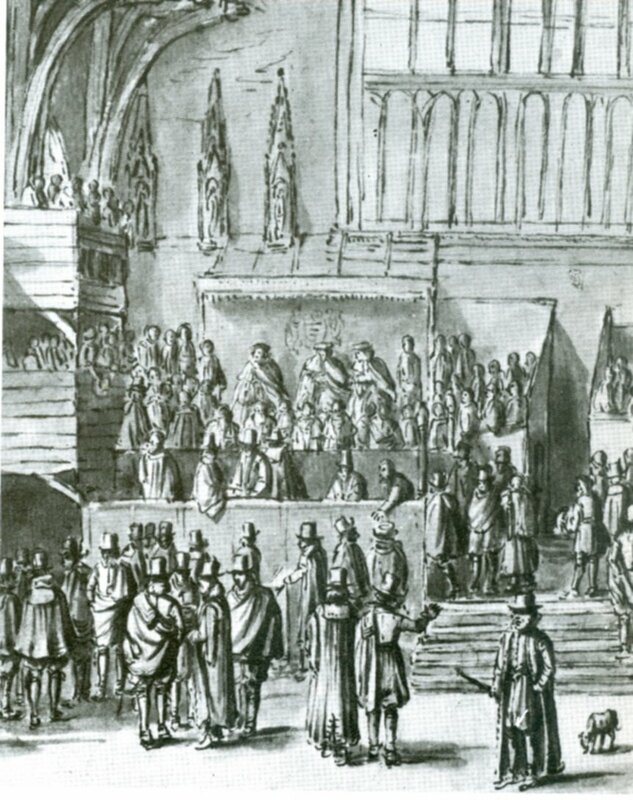 Her paper explored something of the power struggles between the Portuguese crown and medical faculty for the assumption of medical authority and control over medical licensing. While the topic of conflict will be a familiar one to anyone studying early modern medical practice in Britain, it was really interesting to explore the same themes in a different context. The relationship between different types of medical practitioner in the past has often been fraught. I’m oversimplifying here but, in general, physicians did not like surgeons as they saw them as low-status butchers who got their hands dirty. For their part, surgeons did not like physicians, whom they viewed as arrogantly adopting a position of superiority, often without basis. 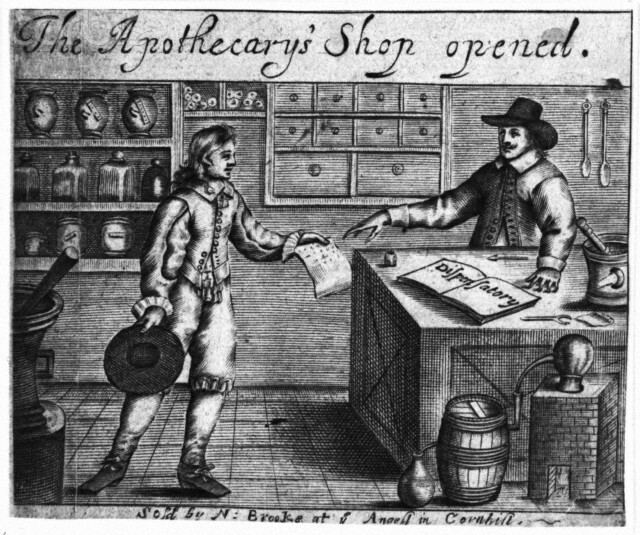 Apothecaries were not popular with either group since they often dabbled in physic and surgery – something they were not supposed to do. Quacks, cunning folk, ‘old women’ who healed and other types of ‘irregular’ practitioner, were pretty much attacked by all other practitioners! This apparent antipathy worked on a macro level, with entire groups entering paper wars and public slanging matches. But it is also clear that individual practitioners were prepared to take each other on if they thought that their territories were being invaded. I was reminded of a particular dispute between Exeter practitioners that was so vociferous that it ended up becoming a libel case in the Star Chamber court. On May 10th 1604, the Exeter physician Thomas Edwards accused one of his colleagues – and possibly former friend – John Woolton of libel. The two men came from different backgrounds. Woolton was an Oxford graduate, son of a former Bishop of Exeter, holder of a medical licence and, later, an MD. In this respect he was about as ‘orthodox’ a physician as it was possible to be and was a leading physician in the town. Edwards, by contrast, had come to practice through the more usual route of apprenticeship and learnt his trade by observing his master, Francis Pampergo. Although he briefly went to Oxford, Edwards returned and established an apothecary business in Exeter. Problems began to arise when Edwards, the apothecary, began to practice medicine, as well as selling drugs in his shop. Apothecaries were nominally banned from practising medicine, so Edwards was effectively breaking the law. 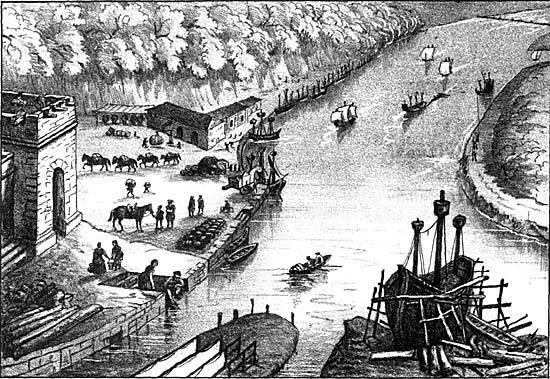 In so doing, though, he also brought himself into direct competition with the prominent Woolton – a competition that Woolton was not prepared to tolerate. Some time late in 1603, Woolton wrote a letter to Edwards which, even by the libel standards of the day was couched in the bitterest terms. Woolton began by addressing Edwards as ‘Master Docturdo and Fartado’ – hardly endearing terms to begin with. He went on, though, to launch a series of attacks on Edwards’ credibility, character and reputation. Edwards was accused of everything from dishonest dealings with his suppliers to the excessive bleeding and purging of one of his patients – Sir William Courtenay. Interestingly, Courtenay had originally been one of Woolton’s patients, so was he bitter at losing this prominent member of the Devonshire gentry to a mere ‘empirical’? The crux of the complaint, however, lay in Woolton’s objections to Edwards’ practice. “Your master taught you not to go beyond your mortar and pestle [and so] you aught not to minister so much as a clyster or open a vein’. Woolton backed up his objections by stating that Edwards was using dangerous substances in his ‘desperate practice’, including mercury, ratsbane, brimstone and aqua fortis, all of which were part of the chemical arsenal of Paracelsian physicians and which, argued Woolton, Edwards had insufficient knowledge of’. Woolton made several copies of his letter, keeping one for himself, sending one to Edwards and passing on some to ‘divers others’ who published them, making the allegations widespread. The result of this was inevitable; Edwards was enraged. Reports suggest that tensions elevated and Edwards went looking for the doctor, with his rapier drawn. Woolton spotted him and shouted that he should ‘go back to his pestle and mortar’. The battle lines were drawn and Edwards sued for libel. These were serious allegations the ‘publishing [of which] doth provoke malice and breach of the peace’. Edwards’ reputation was in the balance and everything hinged on whether the judges and court were sympathetic to the word of an apothecary against a prominent, university-educated physician. The judgement was conclusive, and Woolton was censured…in fact severely! The Lord Coke ‘began a very sharp sentence, and the greatest number agreed. He would spare Woolton corporal punishment because of his degree (! ), but he fined him £500’. This, at the time, was an immense sum. The other libellers and publishers were also fined £40 a piece and Edwards was awarded £200 damages. But still Lord Coke had not finished. Speaking ‘very sharply of the sin of libel’ he decreed that Woolton should ‘at a public market at the next general assizes’ be made to stand and publicly confess his faults. For a man of such eminent background as Woolton, the shame of this punishment, not to mention the financial penalty, must have been enormous. Conflict in medicine has been a constant factor across time, but it is interesting to see the level of acrimony that individual disputes about medical authority could engender. The ruinous outcome for one of the parties here demonstrates the intolerance of the courts for those who resorted to publicly defaming rivals, but this did not stop practitioner squabbles from continuing well into the eighteenth century.